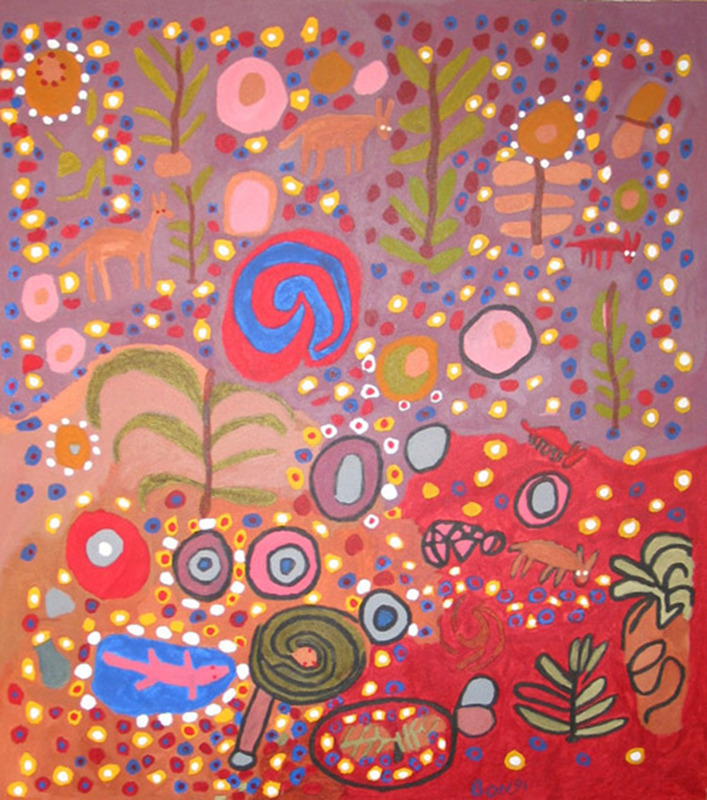 Bongi Kasiki, After the Rain (2009). Acrylic on canvas. Bongi Kasiki’s After the Rain appeared on the Spring 2010 issue of Signs (volume 35, number 3), which featured a comparative perspectives symposium on indigenous feminisms. This work of art symbolizes the time after the first rains when summer begins–hence the bright colors, trees growing next to the river, game grazing on green grass. Artist Bongi Kasiki has depicted eland and kudu – these antelope remind her of the season when the game was abundant and they had enough meat to eat. She depicted a lizard in the lower left-hand corner, as this is an animal she fears – something that unexpectedly falls on her sometimes, she relives the fear of trying to get rid of it. To the right of the lizard she depicted a windmill. Finally, the dots and circles remind her of the pieces of cloth women wrap around their bodies as skirts–the beautiful textile designs. © 2009 by Bongi Kasiki. Permission to reprint can be obtained only from the artist. Bongi Kasiki was born during the 1960s in Dirico, Angola. Her family, members of the !Xun San people, were employed by a Portuguese family for most of her childhood. After leaving Angola during the late 1970s (fleeing the war), she settled at the Omega Military Base in Namibia for a few years before leaving with her brother for Tsumkwe. Here she taught herself to work with textiles, sewing clothes and making quilts. After moving to Schmidtsdrift, Northern Cape, South Africa, she joined the Adult Education Programme in 1990. During 1996 she joined the !Xun & Khwe Art & Craft Project and started painting in oil on canvas. She is solely raising her four children and has survived tuberculosis. (Marlene Sullivan Winberg, My Eland’s Heart: A Collection of Stories and Art [Cape Town: David Phillip Publishers, 2003]). Bongi Kasiki can be contacted via the South African San Institute.